A winter rainfall that freezes on the ground is called glaze ice, but when it does so on trees, power lines or or on objects above ground in general then glaze frost. Yesterday ice rain fell from nimbostratus clouds, dark, low-level clouds, at a height of about one kilometre and this weather phenomenon we can still feel in the next few days. The precipitation of ice rain is caused by a warm air layer when the slush or snow fallen from the nimbostratus clouds thaws in the warm air layer but in the cold air layer near the ground the thawed precipitation begins to freeze again, turning into ice rain. 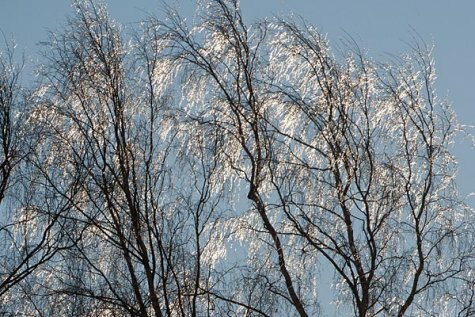 In such a case an ice layer forms on trees or on other objects in the atmosphere if their temperature is below zero degrees (the air itself may already be at plus degrees but frozen branches or power lines for instance have not yet been warmed up): a glaze frost is formed that can create picturesque landscapes in nature but also cause much trouble. If the next day should be sunny, photographers have a feast. In the formation of glaze ice a fast rise of air temperature to above 0 degrees helps. At the same time the ground surface can still be frozen and not yet have been warmed to above zero – thus the birth of such weather phenomena is made possible by the beginning of a thaw and the arrival of a warm front. The ice layer formed by sleet - precipitation that refreezes into ice on the ground - is particularly slippery.